Andrews Bald, Being Bald Can Be a Good Thing! A Good Spot for Views, Wildflowers, and Picnicking! If you love flowers, come in mid-late June when the flame azalea and catawba rhododendron put on a color show. The views of the mountains, lake, and valley below make it an ideal spot for a picnic. So, what is a bald? Imagine a field in the middle of a mountain. That's basically what it is. Balds are flat, open spaces that came about by cattle grazing way back when. To hike to the bald, you'll take Forney Ridge Trail. The trail is rocky and steep, so make sure you have sturdy shoes. A hiking stick might come in handy too. Approximate Elevation: Starts at 6300' at Clingmans Dome Rd. 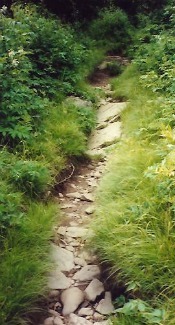 Trail descends to 5800' at Andrews Bald. How to get to the trail: From Newfound Gap Rd., turn onto Clingmans Dome Rd. Drive to the end of Clingmans Dome Rd. and park. 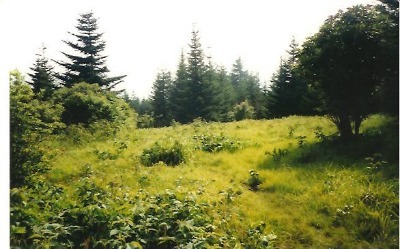 Look between the water fountain and the paved trail to Clingmans Dome tower and take this short access trail to Forney Ridge Trail.